Will they do what you want? 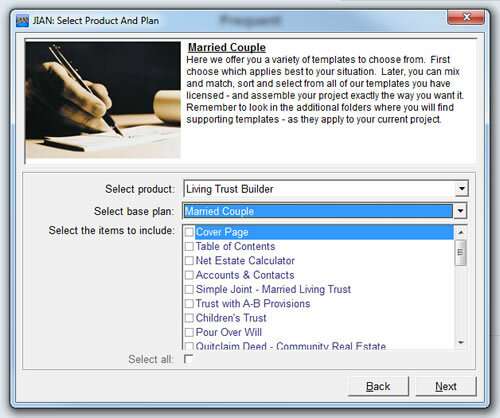 Use this Living Trust – Estate Plan software template to be sure! 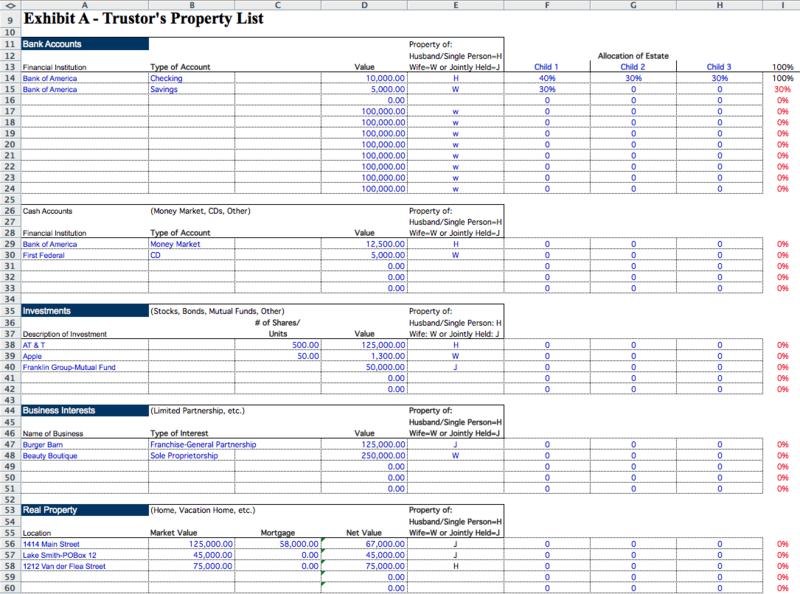 Menu-driven from start to finish, Living Trust Builder provides entrepreneurs and business owners with the most sophisticated living trust development software and document templates available to organize your wishes, calculate your estate, and express your desires with clarity. Living Trust Builder chunks living trust preparation into a series of short sections that help you to address every aspect of your estate plan. One thing about Living Trust Builder is you’ll appreciate all the things you’ve accumulated what you have you been enjoying all your life.In choosing your team will to take over upon your departure, you’ll assess and appreciate the qualities of the people around you. If you’re like many business owners, your business is your life’s work. In a way, it’s the child and fruit of all your labors. And you want it to carry on. A living trust gives you a way to help ensure that the business you’ve worked so hard to build all your life continues to thrive. Is your family capable of running the business together? Or would they fight and sue each other over control, and destroy the business in the process? You can name a successor you feel is competent and capable. You can designate which valued employees you’d like to make sure still have a place in your business. If you have a business partner, or partners, you should insist that they get a living trust as well, so you don’t find yourself suddenly partnered with a kooky ex-spouse if something should happen to them. We include a General Partnership Agreement as well as a Corporate Buy-Sell agreement. Business succession planning reflects well on you and your company if investors raise concerns. Thus you can enjoy the benefits of sound planning from the minute you activate your living trust. Success comes when you establish a layer of protection that allows you to take risk. Risks are a necessary part of being a business owner, but you don’t have to step into it unconsciously. In this day and age, asset protection is no longer an option. No company, regardless of size is immune from litigation. In fact 57% of lawsuits are filed against businesses making less than a million dollars. Do you know that you need a Living Trust? If you’re single and have assets over $5,340,000, or combined assets of $10,680,000 if you’re married (or if you have parents or grandparents who fit into this category), keep reading. You need a living trust. If you don’t get one, you’ll be giving hundreds of thousands to the government when you die, rather than passing your hard-earned assets on to your heirs. The good news is, Living Trust Builder gives you the mechanisms and sound planning advice that can often save you from paying every cent of estate taxes, gift taxes and probate fees. And, if your estate is so large that some estate taxes are inevitable, we can teach you a smart way to avoid paying them through a strategic life insurance plan. Of course, none of us wants to think about “the end,” but knowing that you’ll finally win the tax battle with the IRS might make the thought a little easier. A living trust gives you more than just potential tax and probate savings. It also provides control. Control over how your affairs are managed after you pass on. Control over what happens to your business. It even gives you more control when you’re alive, by providing specific provisions on how you want to be cared for in the event of serious illness or incapacity, and how you want your affairs to be managed during that time. And when you know you’ve planned for every contingency, it gives you something even more priceless – peace of mind. Could YOU be put in a home against your will? Living Trust Builder — Complete. Easy. Fast. Professional. 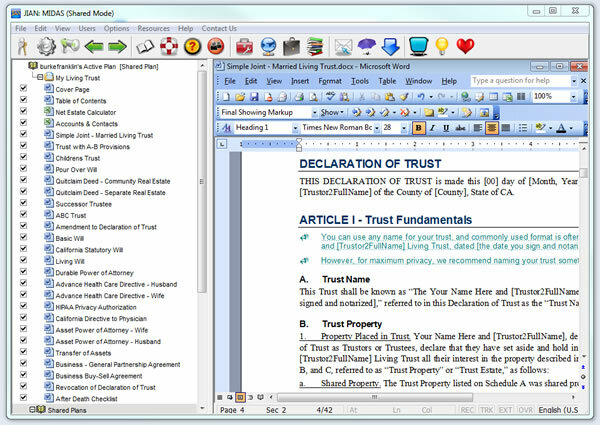 Customizable, comprehensive Word templates form the basis for the entire living trust — Add / Edit / Format the text any way you like! 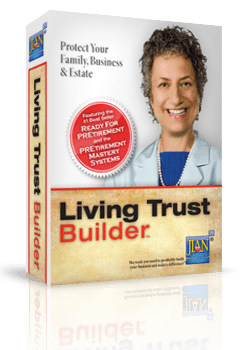 Already have an old copy of Living Trust Builder? Living Trust Builder is the most complete and up-to-date trust package on the market, developed by experienced estate planning attorneys who’ve been preparing living trusts for 30 years. We include a choice of 5 trusts and an estate calculation worksheet, plus supporting documents like Pour-Over Wills, Powers of Attorney, and the Quitclaim Deeds you need to complete an effective living trust, answer questions, and dispel the myths. Plus, everything has been translated from “legalese” into plain English. Living Trust Builder has all the forms and information you need to set up your living trust yourself, so you’re not paying a lawyer for hours of typing (which, by the way, you won’t have to do either). Of course, you should still have a lawyer review your trust when you’re done, to ensure you haven’t overlooked any special circumstances or the all important “trust funding” to get your assets retitled in the name of your new trust. With 80% of the work done, most lawyers will agree to look it over for a few hundred dollars, depending on estate complexity. With Living Trust Builder, you’ll not only have saved about $2,000, but you’ll be far more informed about these issues of vital importance to you and your heirs. Who Will Manage My Living Trust? Find peace in knowing that you’ve done the right things for yourself, your business and your family: A living trust can protect your business, manage how you are treated should you become ill, give you control over what happens after you die, save your heirs hundreds of thousands of dollars in taxes. “Ready for Pretirement is a comprehensive guide both the covers everything you need to know that retirement planning. Author Kris Miller breaks down the big, scary money words and turns able to understand provide the tools you need to get started immediately. If I have a will, do my assets have to go through the probate process? Is joint tenancy an effective way to avoid probate? Who controls the assets of a trust? Can a living trust avoid death taxes? How do I take advantage of both exemptions? Can I plan for estate taxes if I am not married? Does a living trust speed up the distribution of my assets? Can I avoid creditors with a living trust? Is a trust more private? How do I know if a living trust makes sense for me? “Our firm usually charges $1,600 to prepare a living trust from scratch. I can imagine that many people like to do certain things themselves because they enjoy the satisfaction and want to save money. That’s fine. There’s plenty of business for us lawyers. The important thing is to do something now. Get a complete living trust-based estate plan in place because it can really pay off when you need it most. This is no time to buy a cheap product. One day you may find yourself taking care of an elderly parent who is in declining physical or mental health. This can be stressful, both emotionally and financially. On the financial side, there are steps you may want to take to prepare for this situation. Talk to your parents about their financial affairs. Parents may be reluctant to discuss their finances, but someone needs to know the names of their lawyer and accountant. Someone needs to know where their important financial papers are located. If they are still fit, encourage your parents to make a detailed financial list for you, including information about bank accounts, investments, insurance policies, retirement plans, location of safe deposit boxes, etc. Getting familiar with important information now will be much easier than trying to find this information after a parent becomes physically or mentally impaired. Review your parents’ financial picture together. Do your parents have enough retirement income and savings to provide for their needs? Should steps be taken to help stretch their assets over their life expectancies? What if they eventually need nursing home care? Assess whether long-term care insurance makes sense for them. Consider these important documents. A durable power of attorney allows another person to make financial decisions on a parent’s behalf if he or she becomes incapacitated. A medical directive or living will is a document stating a parent’s wishes about medical treatment in case he or she becomes too ill to communicate these wishes. Sometimes the best way to see if something fits what you are doing is to just try it. If you download Living Trust Builder now, you can see how well it handles your specific needs and fits the nuances that make your estate plan. If it’s not right for you, we will pay you back—there’s nothing to ship, no taxes, and you can keep the software anyway (your karma can be the judge!). Now you can complete your living trust with Living Trust Builder software. With expert business advice at every step of the process, plus a qualified review, this crucial project can be behind you.